The oceanfront is calling your family to come to North Myrtle Beach, SC and enjoy a beach vacation. The Verandas by the Sea is an oceanfront North Myrtle Beach resort in the Ocean Drive section of North Myrtle Beach, South Carolina. It is a high-rise tower with plenty of on-site amenities. The location of this North Myrtle Beach vacation resort puts you in the middle of all the hustle and bustle of North Myrtle Beach. There are beach clubs with shag dancing and live beach music just down the road from Verandas by the Sea. This oceanfront resort boasts a parking garage, oceanfront and ocean view condominiums and an oceanfront sun deck with a swimming pool, hot tub and lazy river. The oceanfront pool deck at Verandas by the Sea is so inviting. 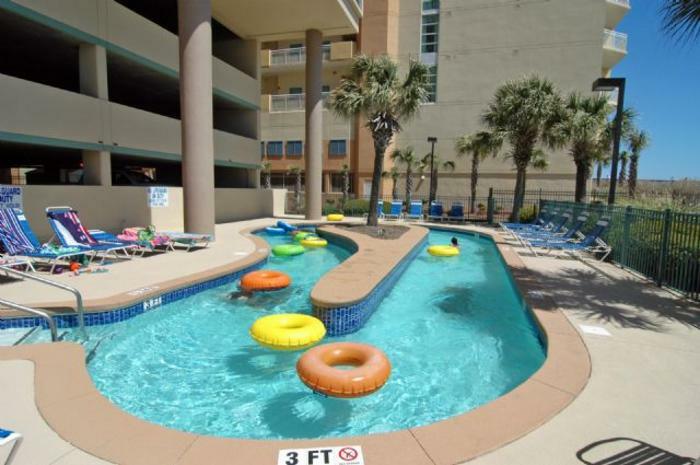 It is a North Myrtle Beach vacation retreat with one-, two-, three- and four-bedroom North Myrtle Beach condominium rentals that can accommodate up to one dozen people for a memorable North Myrtle Beach vacation. Most of the fully furnished kitchens have a dishwasher and most of these North Myrtle Beach rentals also have a washer/dryer unit. There are more than 100 Myrtle Beach golf courses in close proximity to Verandas by the Sea and live entertainment theatres are nearby, too. Shopping, dining, boating, fishing, Sea Doo rentals and parasailing are minutes away! Elliott Beach Rentals is not affiliated with onsite management or the HOA of Verandas.